The tiny skeletal remains of human "Hobbits" found on an Indonesian island belong to a completely new branch of our family tree, a study has found. The finds caused a sensation when they were announced to the world in 2004. But some researchers argued the bones belonged to a modern human with a combination of small stature and a brain disorder called microcephaly. That claim is rejected by the latest study, which compares the tiny people with modern microcephalics. Microcephaly is a rare pathological condition in humans characterised by a small brain and cognitive impairment. In the new study, Dean Falk, of Florida State University, and her colleagues say the remains are those of a completely separate human species: Homo floresiensis. They have published their findings in Proceedings of the National Academy of Sciences. The remains at the centre of the Hobbit controversy were discovered at Liang Bua, a limestone cave on the Indonesian island of Flores, in 2003. The specimens were nicknamed Hobbits after the tiny creatures in JRR Tolkien's Lord of the Rings trilogy. The researchers believe the 1m-tall (3ft) people evolved from an unknown small-bodied, small-brained ancestor, which they think became small in stature to cope with the limited supply of food on the island. The little humans are thought to have survived until about 12,000 years ago, when a volcanic eruption devastated the region. 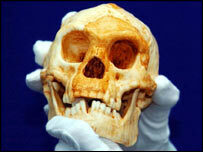 LB1 possessed a brain size of around 400 cubic cm (24 cu inches) - about the same as that of a chimp. Long arms, a sloping chin and other primitive features suggested affinities to ancient human species such as Homo habilis. Professor Falk's analysis used the skulls of 10 normal humans, nine microcephalics, one dwarf and the Hobbit. The brain leaves a mirror image imprinted onto the skull, from which anatomists can reconstruct its shape. The resulting brain cast is called an endocast. Professor Falk's team scanned all 21 skulls into a computer and then created a "virtual endocast" using specialist software. Then, they used statistical techniques to study shape differences between the brain casts and to classify them into two different groups: one microcephalic, the other normal. The dwarf's brain fell into the microcephalic category, while the Hobbit brain fell into the normal group - despite its small size. In other ways, however, the Hobbit brain is unique, which is consistent with its attribution to a new species. Archaeologists had found sophisticated tools and evidence of a fire near the remains of the 1m-tall adult female. "People refused to believe that someone with that small of a brain could make the tools," said Professor Falk. She said the Hobbit brain was nothing like that of a microcephalic and was advanced in a way that is different from living humans. A previous study of LB1's endocast revealed that large parts of the frontal lobe and other anatomical features were consistent with higher cognitive processes. "LB1 has a highly evolved brain," said Professor Falk. "It didn't get bigger, it got rewired and reorganised, and that's very interesting." This apparently contrasts with LB1's other "primitive" anatomical features. In September last year, Professor Teuku Jacob and colleagues published a scientific study in Proceedings of the National Academy of Sciences which claimed the Hobbit showed similarities to living pygmies and to microcephalics. However, a different analysis by Australian researchers, published last year in the Journal of Human Evolution, supported the idea that LB1 was a creature new to science.